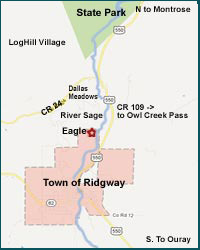 Highlight of the Dennis Weaver Memorial Park Features is the Eagle Monument. 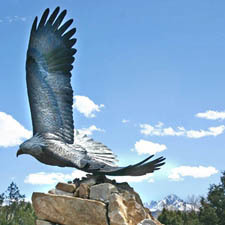 The bronze sculpture weighs 2,800 pounds and has a wingspan of over 20 feet. 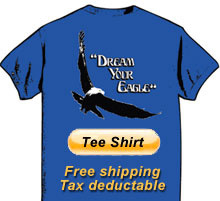 The Eagle is the centerpiece of the astronomically aligned medicine wheel, a ring of stones, like spokes, which radiate from the huge stack of stones holding the Eagle. 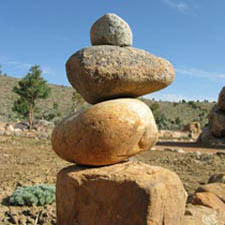 The stones, stacked as “cairns,” often contain prayers or tributes to loved ones. Near the entrance to the medicine wheel, the Poem Rock is inscribed with Dennis Weaver’s poem about the Eagle. 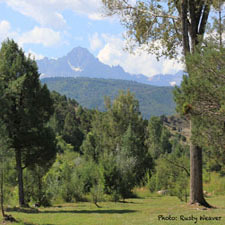 The Park also features a lovely picnic area along the river and miles of hiking and biking trails. 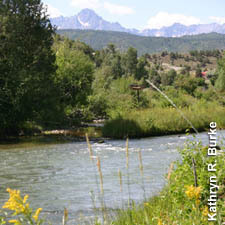 The 60-acre Park is also a nature preserve and riparian area, so you will see wildlife, waterfowl, and wild birds, including eagles, which nest here along the river. We even have a resident blue heron! The Park also hosts various events, including a Summer Solstice Ceremony and an annual Paint in the Park contest. Something for everybody, all year long. Click on any image to see more about that park feature. 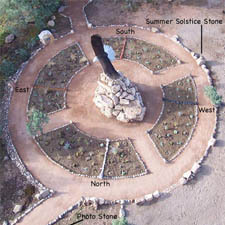 Medicine Wheel – with outer rings radiating out from Eagle centerpiece. 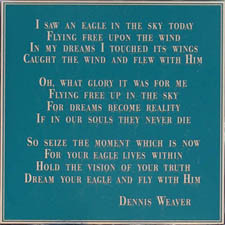 Poem Rock – inscribed with Dennis Weaver’s poem about the Eagle. Carins – stacks of stones containing prayers or tributes to loved ones.